As early career researchers of AACR, we represent the next generation of scientists making discoveries in preventing and curing cancer. Help us in our mission by joining or donating to our team in the 2019 AACR Runners for Research 5km Run/Walk in Atlanta, Georgia. 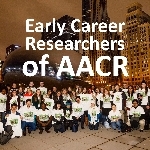 The perspectives of early career researchers (Associate Members of the AACR) are represented by the Associate Member Council, a leadership body of the AACR promoting the professional development of early-career scientists throughout the world. There are over 15,000 Associate Members in the AACR investigating all aspects of cancer research across all regions of the world. Our team welcomes all early career researchers, Associate Members of the AACR and supporters of the next generation of researchers. You don't have to be a scientist to cure cancer. Help us raise funds for the next cancer discovery.